Home / Friends and Family / Merry Christmas, Hosers! Although I was (and still am) quite fond of maps, I knew the way to The Farm very well. If I could have reached the pedals of the car, I could have drove myself there. I knew the order of the towns, I knew which swing was my favourite in the little park in Saskatoon, I knew that Chamberlain had the best ice cream cones around and I knew that once we hit Regina it would only be a matter of an hour and a half and we’d be pulling into the yard. Even today; when I road trip anywhere I have scheduled stops. I stop at the same places all the way to my destination and back. Habitual from way back when. Christmas is probably the reason I love to road trip so much too. That last hour and a half was torture for me every time we went. The towns, in reality not that far apart, took forever to get to and only a second to pass through. Regina, White City, Davin, Vibank, Odessa, Kendal, Montmarte, Candiac, Glenavon… Peebles! WINDTHORST!! The LONGEST DIRT ROAD EVER!!! Ah… the lane way! Finally! It would be dark every time we drove up. I already had my various books and colouring stuff put away, my coat on, my shoes on and my seatbelt off. But, despite my preparation, my effort was always in vain. Gramma always beat me. By the time we had all piled out of car, Gramma would have the storm door open and I’d see her standing there. Her silhouette strong in the door way, hand poised on the door knob to let us in. Then I knew I was home. Christmas was always such a great time for me when I was younger. 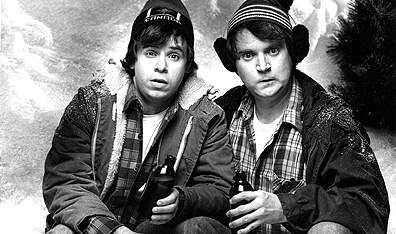 I had a few uncles still living at home and they used to have Great White North: Bob and Doug McKenzie on vinyl, which I would repeatedly request to their (I’m only vaguely assuming here) annoyance. They’d play that album a thousand times over the holidays for me, in between chores, hockey and curling in town, snowmobiling over the fields, skating on the dugout and jumping off the car garage into the massive snowbanks. I used to get such a kick out of the Twelve Days of Christmas song, so this is my present to you. MP3 link below (right-click to save as or click to simply listen). Take the song, it’s funny. I dedicate it to all Canadians everywhere (especially those who watched SCTV) and also to my crazy American friends who go shopping for Christmas the day after Thanksgiving. This is pretty much what Canada (the Great White North) is all about. Stan and I are going to “take off, eh”. We’ll be out at The Joint for a few days there over the holidays. Beauty. spinning… Twelve Days of Christmas by Bob and Doug McKenzie. This link is available only for a short time. All music shared here is for the purpose of promotion. I encourage you to purchase anything that is recommended here, but that’s just according to my taste in music. If I have promoted your music and you wish to have its link removed from my site, ask and it shall be done. Please enjoy. 07/07/07 – first days for everything..
Merry Christmas to you & Stan, Tina. Hugs & kisses!